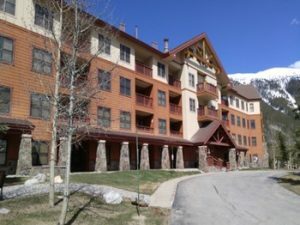 Copper Springs Lodge is a great condo complex in Copper Mountain CO Real Estate. Located in the East Village of Copper Mountain, Copper Springs Lodge is located steps from the Super B Lift for skiing and snowboarding. In the summer this Copper Mountain condo complex is situated next to the Copper Creek Golf Course designed by Pete and Perry Dye. While Copper Springs Lodge is located in the East Village you are a short walk, drive or bus ride from Center Village for dining and activities. Built in 1998, there are a total of 108 condo units comprised of 45 – one bedrooms, 49 – two bedrooms and 14 – three bedrooms, this gives Copper Mountain buyers a variety of units to chose from. Copper Springs Lodge has a wide array of amenities including three exterior hot tubs, large lobby/lounge area with fireplace, fitness room, sauna, billiards table, ski lockers, underground garage parking and bike storage for owners and guests to enjoy. While relaxing on the units private decks views of the ski slopes of Copper Mountain Ski Resort and views of the surrounding mountains can be seen. Another benefit of purchasing in Copper Springs Lodge is that the dues are low and there is no transfer tax. When looking for condos for sale in Copper Mountain CO Real Estate make sure you see what is for sale in Copper Springs Lodge.